The movie Elysium is so preposterous that it is laughable. In the year 2159, two classes of people exist: the very wealthy, who live on a pristine man-made space station called Elysium (Greek for Paradise), and the rest, who live on an overpopulated, ruined Earth. The people of Earth are mostly Latino and white trash and desperate to escape the planet’s crime and poverty, and they critically need the state-of-the-art medical care available only on Elysium. Those in power on Elysium will stop at nothing to enforce antiimmigration laws and preserve their citizens’ luxurious lifestyle. The only person with the opportunity to bring equality to these worlds is Max (Matt Damon), an ordinary guy in desperate need to get to Elysium. With his life hanging in the balance, he reluctantly takes on a dangerous mission, one that pits him against Elysium’s Secretary Delacourt (Jodie Foster) and her hard-line forces. What makes the movie a joke is that the man made space station is supposed to have its own defense system but spaceships from earth continually find a way to get through and wreak havoc upon its uber rich citizens. 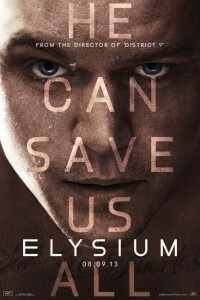 From the director of the Best Picture Oscar nominee District 9 Elysium fails miserably.